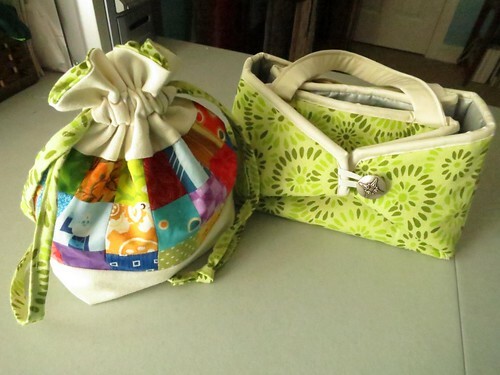 You may remember awhile back when I made a drawstring bag to carry my handstitching supplies. And those of you with really good memories may recall that I wanted to make an iron caddy. Well part of what was holding me up on the iron caddy was choosing a fabric. Because you can use it as a pressing pad, it's important to use a single piece of fabric (no seams to cause wrinkles and bumps). And I was suffering from perfectionism. Especially once I completed the drawstring bag and realized that I would really prefer it if they matched. Finally I decided I needed to jump in. So I went digging through my fabric stash. Holding up this and that to see how it went. It was while doing this that the obvious answer jumped out at me...make the iron caddy from the lovely green linen I used as the interior of the bag! It coordinates! It's one of my favorite fabrics, in my favorite color! And it would be just one piece! The iron caddy itself is a neat pattern. I can't take credit for that (though it was a free download, so I'm happy to pass it on if you want a copy, just send me your email address.) or even for discovering it (that would be one of the benefits of a quilt guild!). The pictures above show how it works--folding down into a flat surface which you can use to iron on. The best part though is that the heat resistance fabric means you can pack up a still warm iron without worry of burning a hole in your bag or your car's carpeting! Which means you can iron longer into a workshop or sewing day, not having to unplug before you go! I'm really happy with how this turned out, from the beautiful fabric to the precious buttons (purchased in high school for a cloak that never came to be) to the careful stitching that lead to no seam ripping, even with the thick layers of batting, insulation, fabric, and iron covering. Next on the "sewing for me" list? A large tote bag with pockets to carry my project bins, small tools, rulers, rotary cutter, marking pins, etc. Matching, of course.